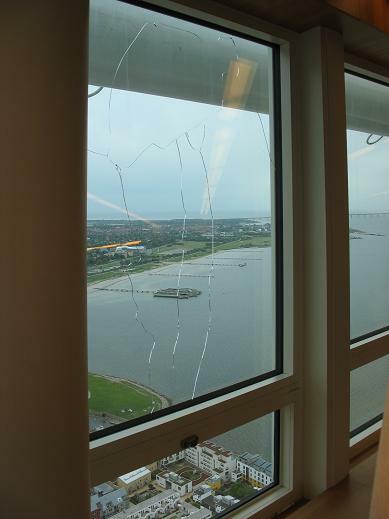 Cracked windows Turning Torso? Yes, maybe you’s notice that? Turning Torso is a building with some special effects. Some of them aren’t intended they are more a result of the special construction. Turning Torso is situated very close to the sea and the wind or storm can be really heavy during the long fall and winter. Besides the construction is twisted and, as in all buildings, there are movement within the construction. Cracked windows is therefore a result of the natural movement within the construction due to heavy wind and changes in temperature. Not everybody knows that there are quite some windows broken every year in this building. When the construction moves it stresses the glass in the windows. Some of them can’t handle the movement and they crack and get broken. They say that the sound of a cracking window is very loud – almost like the sound of a gunshot. This happens even for the tenants. An unexpected event. However the windows are changed – this is known and it’s a part of the normal maintenance of the building.